Did you know that you can mix vinegar with baking soda for a variety of amazing uses? We have put together 10 of the most popular uses for baking soda and vinegar. These ideas for baking soda cleaning and vinegar are so clever! I bet some of these uses for baking soda and vinegar together will surprise you! Your home will be so clean! Vinegar is such a universal liquid! You can use it for cleaning a variety of items around your home and outside as well. Combine baking soda and you have tons of more uses! 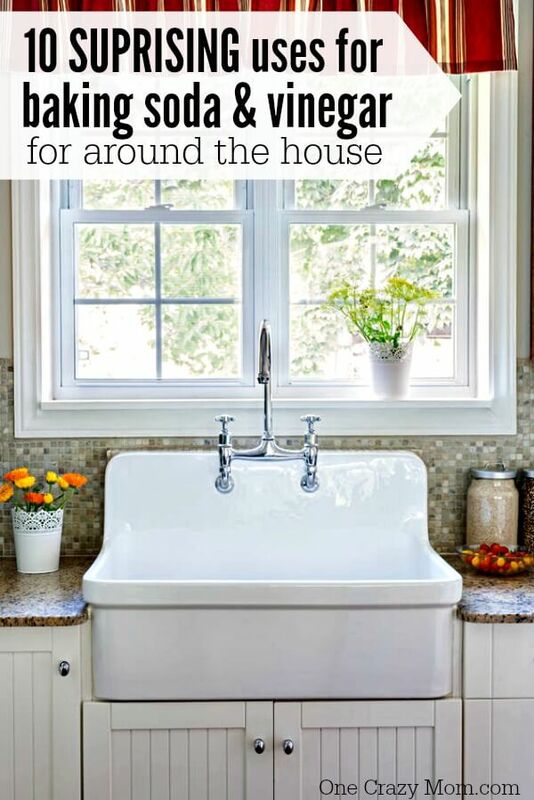 Plus, learn how to keep your house clean with just one daily task! Truly, doing this one thing has changed so much for us. It’s less hectic and things just flow better! Can you clean with baking soda and vinegar? Yes! Yes! Yes! Can you tell I’m excited about this? 🙂 This combination is an incredible cleaning combination that most people already have on hand. I believe this combination is not utilized enough because people just do not know all of the uses! After you read this article on the many baking soda and vinegar uses, you will know all that you can clean with this. Let’s get started! What happens when you add baking soda and vinegar? These two together make a fantastic cleaning combination and I thought would be perfect to go with our Spring Cleaning Checklist. I think some of these household uses for vinegar and baking soda will surprise you! When you combine baking soda and vinegar they create a fantastic cleaning combination that is not only incredibly efficient but very inexpensive! This combination will replace so many of your cleaners and those can really add up. Grab some vinegar and baking soda and get to work! You will save a ton of money and your house will look great. Plus, I like knowing that I’m not spraying a ton of chemicals around my house. We have been trying to use more and more all natural products and I am loving it! From makeup remover to All Natural Lip Balm, we are slowly transitioning to everything natural. Using baking soda and vinegar in our homes is another step in the right direction. Don’t get overwhelmed by trying to do it all at once. Just make a list and try something new each week. You will have a lot accomplished in no time at all! Like most things in life, if you try to do it all at once, you will get frustrated. So, just stick to your list and do it little by little. Flush drain with HOT water (You may even want to boil some water and pour it down the drain). Add about 1/2 cup baking soda to your drain. Pour a mixture of 1 cup HOT water and 1 cup vinegar down the drain. You will notice a lot of bubbles at first. After the bubbles subside, run HOT water from the tap down the drain for a couple of minutes. This might not work on every clog, but it does a pretty good job for gunk and grime build up. It’s worth a shot and I bet it works for you! If your washing machine has a nice little ring around it (or worse), it might be time to clean it. Cleaning your washing machine is VERY easy with baking soda and vinegar. Fill your machine up to full with HOT water. Add about 1 cup of baking soda and let the machine run (don’t put any clothes or anything in). When the machine gets to the rinse cycle, use vinegar in place of liquid fabric softener. Again, let the machine finish running. When the load is finished you will have a nice, clean washing machine. If you are left with a couple of dirty spots, you can use your cleaning toothbrush with a little baking soda. So easy! It will look like you purchased a new washing machine. Do you have towels that have lost their clean and fresh smell? One of my favorite ways to use baking soda and vinegar is to freshen up towels. Simply add about 1/2 cup baking soda in place of your regular laundry detergent. Then add vinegar in place of fabric softener during the rinse cycle. Dry normally and you will notice your towels have a brand new freshness. They will feel and smell like new towels. I love how soft they are after doing this. Try this before you toss them out and buy new towels. I have a feeling you will love how they turn out and it will save you money! 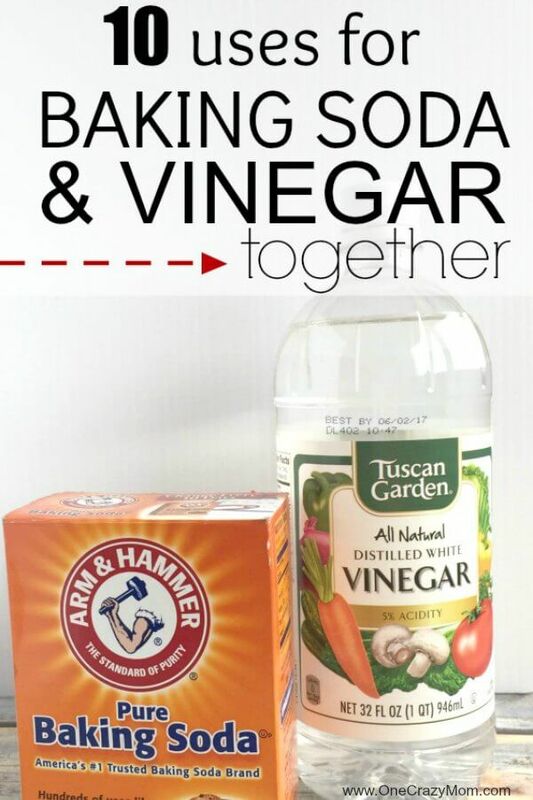 If you have grout that you know needs to be cleaned and you don’t want to pay a a professional cleaning service to get it looking like new, try this vinegar and baking soda combo. Sprinkle baking soda in the grout, then spray vinegar over baking soda. (I bought spray bottles on Amazon.) Allow the vinegar to react to the baking soda before cleaning the grout – I like to use a cheap toothbrush to scrub the grout (doesn’t take much work) and then a rag to wipe up the dirt. Dip the toothbrush in a cup of water to rinse in between scrubbing. Give the kids toothbrushes, too. They’ll love watching the baking soda and vinegar reaction. Plus, with the entire family helping the task will be easy and go quickly. Let everyone get to scrubbing. If you have an iron that has seen better days, try cleaning it with baking soda and vinegar. Make a paste with baking soda and water. Rub the paste all over the iron, being careful of the holes. While the paste sits on the plate of the iron, make a 50/50 mixture of water and vinegar. Add this to your water trough on your iron. Take a wet rag and wipe down the front of your iron. You can use your cleaning toothbrush if you have some trouble areas. Once that is clean, run the steam through your iron (I would do this on an old towel), until all of the vinegar/water solution is gone. Fill the water trough with only water and run through one more steam to make sure you get out any left over vinegar. You iron is now clean inside and out. Perfect! Fill a large measuring cup with 2 cups vinegar and let it sit on the top rack of your dishwasher. Run a complete dishwashing cycle (using hot water). Sprinkle baking soda throughout the bottom of the dishwasher and run the dishwasher again. Your dishwasher should look nice and clean. If you happen to be left with any stubborn spots, you can put some baking soda on a toothbrush and do a little scrubbing. This should do the trick easily. I love to use baking soda for cleaning with vinegar. This vinegar mix will have your dishwasher shining! We love to use vinegar to clean. I have never tried this before, but I have read that you can use equal parts baking soda and vinegar to clean your toilet bowl. Sprinkle about 1/2 cup of baking soda into the toilet, the pour about 1/2 cup of vinegar over the baking soda. Let the bubbles do their thing for about 10 minutes, then scrub with a toilet brush. You should be left with a clean and deodorized toilet. It works great! If you have little boys, the surrounding outside areas of your toilet have seen better days. It seems like I am constantly cleaning the toilet in my boys’ bathroom – inside AND out. Another one of my favorite ways to use baking soda and vinegar in the deodorize the outside of the toilets. I just make a paste with baking soda and water and rub it around the sides and base of the toilet, including the tile surrounding the toilet. Let this sit for 10-15 minutes and then spray vinegar over the top. (I bought spray bottles on Amazon.) Once the bubbles have done their thing, wipe everything up with a clean wet rag. It will be like having a boy-free toilet (for a little while anyway). Your bathroom will look like new and smell so fresh and clean. Mix 1 tablespoon of baking soda per 1 cup water – this is your “shampoo”. Apply to your roots and wash. Then rinse really well. Add 2 tablespoons of vinegar (or apple cider vinegar) per 1 cup of water. Apply to middle and ends of hair (avoiding roots). Supposedly, after a week or so of using this method you will have beautiful, clean hair (and will have to wash your hair less). Have you tired this on your hair before? What other vinegar and baking soda uses do you know? There you have it. 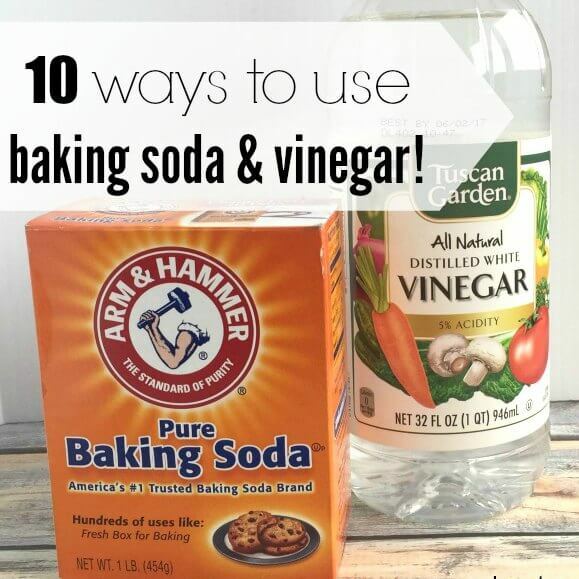 Those are my top 10 ways to use baking soda and vinegar around the home. I love these items because they are inexpensive and easy to use. There are so many uses for baking soda and vinegar. Do you have a favorite way you like to use these 2 household products together? What have you tried and liked (or not liked). Be sure to come back and tell us. We’d love to hear from you. I love baking soda cleaning! Another favorite use I like is to clean my stove with vinegar and baking soda! If you have ever purchased this type of cleaner, you know it’s pricey. This method works just as well if not better and it’s all natural. Plus, it’s very cheap! Let us know any ways you use this so we can all learn! We love to save money and do things efficiently around here. Don’t you? 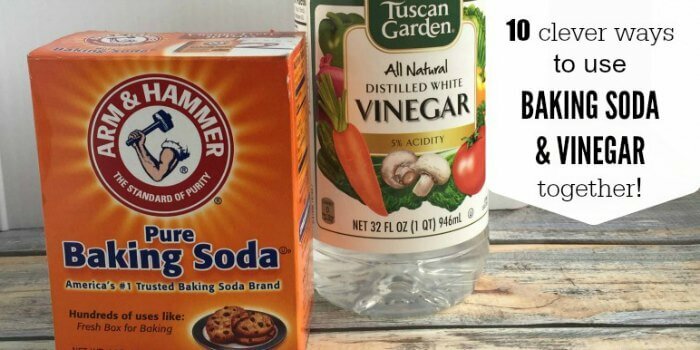 Now you know 10 amazing Baking Soda Uses plus vinegar! There are so many cleaning uses for vinegar and baking soda. Get started today and you will love how well these work together! It’s amazing! You are going to wish you used this combination to clean sooner. If I can find something that not only works great but saves me money, I’m all about it! Another plus if it works great. This combination is a winner all around! I can’t wait to hear your thoughts so come back and leave a comment once you have tried this. If you like finding alternate uses for things, you might also enjoy 25 uses for dryer sheets. Many of the ideas will help you save some extra cash. You might also like 20 Uses for Baby Oil that will save you money! Learn about 15 Coconut Oil Uses that will help you in lots of different ways while being budget friendly. I have tried the baking soda shampoo, and apple cider vinegar rinse. The very first time you use it you will see a big difference in you hair. It will be cleaner, have more shine, and be softer. Thank you for all the ideas. It’s great to know that baking soda and vinegar has so many uses. I always use it to unclog sink drains.